On Murdoch and Liberal Bias At NPR : NPR Public Editor What does the coverage of the scandal at News Corp. say about NPR and its critics? News Corp. CEO Rupert Murdoch pauses as he delivers a keynote address at the National Summit on Education Reform on Oct. 14 in San Francisco. NPR has long been accused of being liberal, but a review of the coverage these past four months of a story tailor-made for liberal fangs may be instructive over how true the charge really is. The story is the ongoing phone-tapping and bribery scandal battering Rupert Murdoch and his media conglomerate, News Corp. Investigations, suits and shareholder revolt are growing here and in Britain. But the many accusations of liberal bias in NPR's coverage prove, at least in this case, to be more perception than reality. They may also be politically motivated. There is no love lost between the Murdoch organization and NPR. Avowedly conservative commentators at two of Murdoch's properties, Fox News and The Wall Street Journal, routinely slam the public network. They had good fodder, for example, in NPR's bungled firing a year ago of Juan Williams. Williams, who now works full-time for Fox News, has returned to the attack in a recently released book, Muzzled: The Assault on Honest Debate. In it, he accuses NPR of trying to suppress non-liberal opinions. "I think that what was behind it in the mind of the executive that fired me was my willingness to work for Fox and to engage conservatives and to stand up and make arguments that oftentimes were construed as conservative arguments," he told NPR's David Folkenflik. "NPR's media reporter, David Folkenflik, was dispatched to London posthaste and is treating this story as the second coming of Watergate. 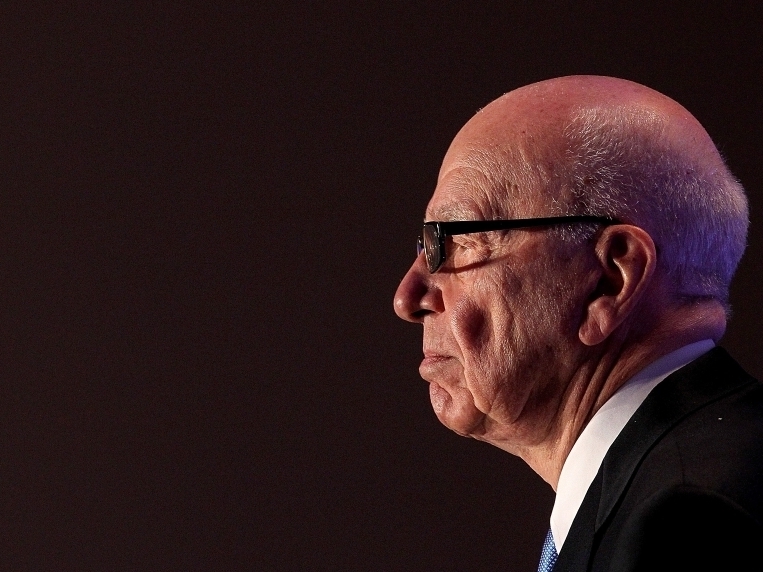 Murdoch, like Nixon, must roll. So dizzy has NPR been that they gave full airing to what we now know was a false Reuters report on how News Corp. does not pay taxes." I want to learn from the advocacy groups. But not much of their criticism holds up. Tim Graham, director of media analysis at the right-wing Media Research Center, wrote in his NewsBusters blog, that "unsurprisingly, Fox-hating National Public Radio has eagerly embraced" the story. Interviewed in The Washington Post, Graham suggested that blame partly lay in a $1.8 million grant that NPR received last October from the Open Society Foundation—funded, he said, by "Murdoch-hating" George Soros. NPR was thus motivated by "a special financial interest in going after Murdoch's media properties." Some listeners were critical, too. "Wow, your bias is showing?" wrote Cheryl Garland of Charlotte, NC. "It might help if your commentators and reporters were not gleeful at the prospect of the demise of Mr. Murdoch. Shame on you for the misrepresentations." Others criticized use of such language as "scandal" and "empire." Chuck Worner of Freeland, MI, was especially offended by a Tell Me More segment in which host Michel Martin said News Corp. owns Fox without noting that it also owns such (presumably more respectable) properties as The Wall Street Journal, National Geographic Channel, Big Ten Network, and others. To bring us to date on the news at News Corp.: Murdoch's youngest son James now faces a second British Parliamentary hearing after two of his senior executives said he knew more about the extent of widespread phone tapping by the company's now shuttered News of the World than what he said in a first hearing on July 19. The son says the two are confused. 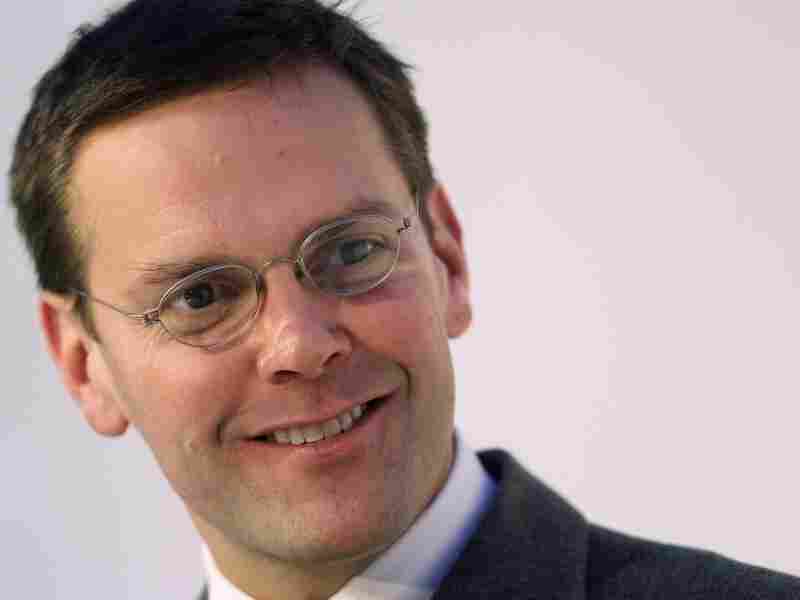 James Murdoch, son of Rupert Murdoch, is the Chairman and Chief Executive of News Corporation, Europe and Asia. The elder Murdoch, after dramatically apologizing to Parliament in the July hearing, now faces a potentially tumultuous shareholder meeting this week in which two prominent shareholder advisory groups and many investors are demanding that he and almost all the board be fired for poor governance. These complaints from Wall Street—not political foes—go beyond the phone tapping to include nepotism, questionable investments and a winking corporate culture in some of the company's units. A group of pension funds and institutional investors who are shareholders have filed a related suit in federal court in Delaware accusing the U.S. company of abuses and illegalities. These charges, according to the Associated Press, involve alleged hacking into technology used by New Corp.'s satellite TV rivals and spreading false information about competitors in the newspaper advertising business. Both the Justice Department and the London police are investigating News Corp. and its British subsidiary, News International, for bribery. Two top officials of Scotland Yard have resigned amidst accusations that they received payments from the company's editors. A dozen editors and reporters have been arrested for the hacking, corruption or both, though none yet have been charged. These include one editor who went on to be Prime Minister David Cameron's spokesman and another who became chief executive of Murdoch's British subsidiary. The chairman of Dow Jones, publisher of The Wall Street Journal, has resigned, though he has not been accused of having done anything illegal there or during his earlier tenure at the British company. As of last week, meanwhile, 65 crime victims, celebrities, politicians and others in Britain have filed hacking suits against the subsidiary. The company already has paid out millions of dollars—an astounding $650 million, according to New York Times reporter David Carr speaking on All Things Considered—in settlements to make similar cases go away. Everyone in the room knew it was Murdoch's special genius to know how to sell news. Truth in advertising: I have had some minor dealings with Murdoch. Eight years ago, when I was editor and associate publisher of The Wall Street Journal Americas, I spent a long, lazy afternoon with him and a half dozen Latin American publishers in the office of then-Dow Jones Chairman Peter Kann, all at my invitation. I don't think that I am divulging confidences when I say that Murdoch kicked back and ruminated for several hours about newspapers. A dye-in-the-wool newspaperman, he dismissed many modern-day media executives as bean counters and said the business was about news content, and matching it with the right readers. His tabloids such as the New York Post and London's News of the World had populist, working-man content, while his upscale broadsheets, such as The Times of London, were serious publications aimed at professionals. He was low-key and self-deprecating during our meeting, but everyone in the room was aware that it was his special genius to know how to sell news. He then casually let drop that he would like to own The Wall Street Journal one day. You could almost hear the breaths stop in the room—out of fear. But Murdoch owns the Journal now, and while one can argue about its shift to more hard news since he took over, the paper has grown bigger, reclaimed its profitability and expanded its news coverage. It also has maintained its high ethical standards and excellence. I wonder if I would have pitched him my own newspaper venture had he answered otherwise. I am not a "Murdoch hater," in other words. In our meeting, I even asked if he might consider investing in Spanish-language newspapers. I was already planning what later became my own newspapers in Texas. Murdoch responded that he couldn't invest in a paper he can't read. I wonder if I would have pitched him my venture had he answered otherwise. Still, I don't agree with the news standards of many of his tabloids or with his contribution to this country's political polarization. He designed Fox News at night (unlike much of its daytime coverage) to be partisan and sometimes nasty, in this case on behalf of the populist right. The strategy parrots that of his tabloids. Some news media polarization would have happened even if Murdoch weren't in the news business. The march of digital technology made it so cheap to create cable television channels and, now, websites that their optimal business strategy is not to be general and broad as in the early days of broadcasting, but to be narrowly targeted at a small slice of the market. Ahead of most others, Murdoch and his team brilliantly saw the change coming and went for a political slice. MSNBC and others have followed suit. But Fox still sets the mark for being singularly focused. So, what did I find in my review of NPR's coverage of this story? NPR has rightly given a lot of coverage to the scandal, but not more so than other major news organizations or even The Wall Street Journal itself. With the glaring exception of one online headline, NPR's coverage has been professional, sound and calm. There has been no underlying tone of smacking lips, and certainly no liberal bias. At the height of the coverage, the 15 days between July 7 and July 22, when new revelations and events rolled out almost daily, NPR aired 49 stories, not counting hourly Newscast briefs. This is an average of roughly 3 stories a day across seven hours of news programming on weekdays and roughly half that on weekends. Some listeners complained that this was too much, but the story count paralleled that of other news organizations, including the Wall Street Journal. The Journal, though slow off the mark, ran multiple stories on many days. It ran five the day after the Murdochs testified in Parliament. Since then, the Journal has run 36 stories and NPR has aired 11, not including briefs in both. This is hardly overkill by NPR. The print version of a newspaper, moreover, runs once a day and is exposed to its entire audience. NPR has four main daily news programs during the week (two on the weekends), and the audience changes over the course of a day. Seen that way, it can even be argued that NPR underplayed the story. Countering that argument is that each of the shows functions like an independent daily magazine, with fewer stories than a newspaper. As a result, any one story can seem unduly prominent on the radio. It seems that barely an hour goes by without another staggering new development in the phone hacking saga in Britain. The scandal has already engulfed Rupert Murdoch's media empire and has the British government in damage control mode. News Corp. wasn't then "engulfed," but it clearly was badly damaged and shaken by the many revelations, that were indeed then pouring out. With hindsight, her main point stands. The challenge to the company, in fact, has grown. A man rushed up to Rupert Murdoch and tried to throw a shaving cream pie in his face, spattering his jacket. Murdoch's wife, Wendi Deng, tried to attack the assailant. [Sounds of scuffling.] The protester was led away in cuffs. The hearing resumed, with a jacketless Rupert Murdoch. Many stories by NPR and almost all the news media described Murdoch's media holdings as an "empire." The term is overdone but not unfair or even antagonistic. Murdoch has companies and satellite broadcasts around the globe. In the U.S., almost every American has some brush every day with a television show, movie, advertisement or news story produced by News Corp, which Fortune this year ranks as the nation's 83rd largest company. Murdoch controls 40 percent of News Corp.'s stock and thus the conglomerate, making him personally the world's largest news media and entertainment player. The word "scandal" is equally overworked, but hardly signals bias by NPR or any other news organization. 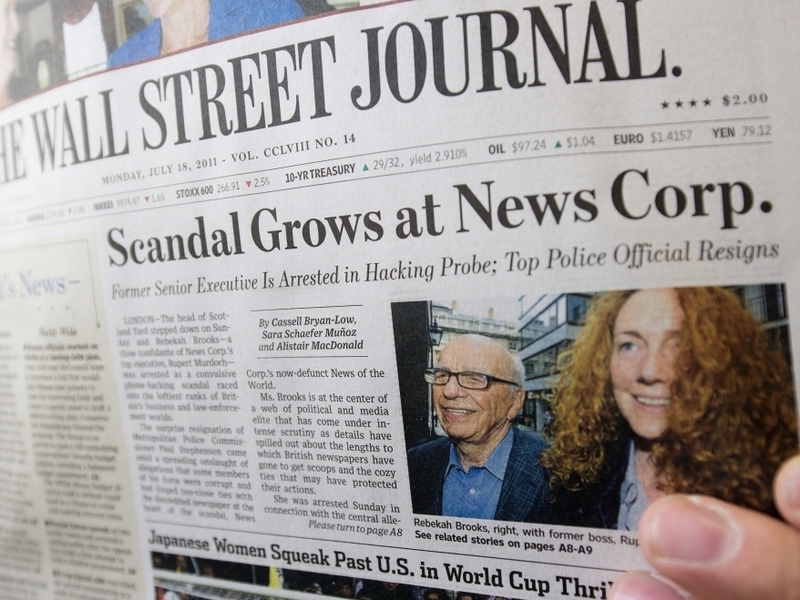 This, for example, was the front page headline July 18 in Murdoch's own Journal: "Scandal Grows at News Corp."
While The Guardian of Britain and The New York Times broke the most damaging stories about News Corp., the Journal contributed in a way NPR did not. The Journal broke the news of the Justice Department investigation, for example. I have to believe that the story that probably personally stung Murdoch the most was one in the Journal on July 20 that, to my knowledge, was the first to seriously question whether the 80-year-old baron was too old to be running the company. The Journal, the flagship of Murdoch's US print operations, also warned that pressure to investigate News Corp. under US laws against bribing foreign officials could backfire on the entire media. The Journal, as befits a business paper, has since led the way on stories about the criticisms over News Corp.'s governance. To those who think NPR unfairly tars Murdoch by using phrases such as "Murdoch's News of the World" because the paper seems such a small and distant piece of his holdings: Murdoch himself considers all the newspapers "his." He regularly checks in by phone with his editors and visits the papers frequently. Newspapers are his original business, and remain the part of News Corp. that he openly loves. None of this, of course, is to say that Murdoch knew about the phone hacking. But the question over what his son James knew now raises questions of family loyalty, boardroom turmoil and how the fickle sword of British and American law will fall. It's a modern corporate version of a Shakespearean royal tragedy. What's not to report? Usually this column responds to listeners' views, but I follow the professional advocates, too, out of respect for their influence and in search for what they may see in NPR's reporting that I don't. I also hope that we might forge a reasonable dialogue. I agree with NewsBuster's Graham that the July 16 headline, "News Corp. Dynasty Crumbles From The Top Down," was badly off. He neglected to mention, however, that the headline was for the online version of an interview on Weekend Edition Saturday and never appeared on air. Still, while the radio programs have by far the larger audience with roughly 27 million listeners each week. NPR.org is visited each month by 18 million unique users. Its quality standards are equal to radio's. The web producer who wrote the headline is on vacation and could not be reached for comment, but NPR.org editors agreed the headline was poorly written. It has not been changed or corrected, however, and should be. I must say, however, that not much of the rest of Graham's criticism holds up. He cites the story underneath the offending headline as further proof that NPR is "liberal" and "relishing" Murdoch's predicament. The story was a July 16 interview by Scott Simon with Financial Times columnist Clive Crook. Neither Simon nor Crook ever said anything about crumbling dynasties, and Crook is hardly leftist. His British-based paper is a conservative business paper (and also a competitor to Murdoch's Journal). In the interview, Crook noted that liberal British Labor Party leaders enjoyed close relationships with Murdoch as much as conservative Tory ones did. Graham also saw the dispatch of reporter Folkenflik to cover the story in London as evidence that NPR was out to skewer Murdoch. I found it normal; Folkenflik covers the media, and this was the year's biggest story on his beat. Moreover, the regular London reporter, Reeves, was in the Arctic Circle on assignment. "Philip was in Greenland, which is just about as far away as you can get really," said Foreign Desk editor Kevin Beesley. I think it's important to indicate these are allegations, not proven. But they do seem substantive. Graham further criticized a Diane Rehm show as uncivil and leaning left. The show is not produced or controlled by NPR, as Graham mistakenly seems to think. Still, NPR distributes it, making it fair game. But Graham misfires. The very quotes he cites indicate that Rehm, her guests and listener emails presented conservative viewpoints as much as liberal ones. Fox's imitators on the left were as criticized as was Fox for lack of civility. Graham minimized Fox's responsibility for the trend towards opinionated cable news, which is his right, but Fox's own executives don't agree. They see themselves as having been on the cutting edge of the trend. Mike Gonzalez of National Review added little help in trying to find a liberal bias in the Murdoch coverage. Gonzalez correctly noted that in an interview on Morning Edition by host Steve Inskeep, Reuters columnist David Cay Johnston wrongly said that News Corp. had received $4.8 billion from tax refunds. Inskeep had Johnston back on his show the next day to correct what he openly admitted was an embarrassing mistake of misinterpreting the company's tax filings. As I wrote at the time, Inskeep and Johnston did not quibble about the mistake and did the right thing by taking full responsibility. Gonzalez neglected to note the source of the error, the correction or the unconditional apology. He instead accused NPR of being "dizzy" to get Murdoch. Perhaps Gonzalez has never made a human error; I have made many. And then there is Juan Williams, whose name inevitably comes up in comments about NPR's coverage of Murdoch and News Corp. I am a Williams fan, but I am afraid that he, too, fails to make his case that NPR is muzzling conservative dissent or African-American voices. I don't think that anyone inside NPR today defends the cruel way Williams was fired, or still criticizes what he actually said about Muslims while being interviewed by Bill O'Reilly on Fox. But as my predecessor, Alicia Shepard, has written, Williams had been whittled back to a part-time NPR contributor and his firing was a long time coming because of tensions between him and management. Who was right or wrong in those tensions is not for me to say. My focus is on whether conservative or minority voices are editorially being frozen out. I am Latino and it does seem to me that NPR needs more minority voices of all sorts on air. But I also recognize that minorities are working their way up and haven't fully arrived yet. I am a testament to NPR's openness, but will follow how many more come. As for conservatives, Mara Liasson, a national political correspondent for NPR, is a contributor to Fox News, too, suggesting that the Williams case was special. Williams himself was interviewed on All Things Considered about his book, and NPR's website posted excerpts of it and gave readers links for where to buy it—hardly suggestive of an attempt by NPR to ignore it. I totally agree with Williams on the need for open, honest and civil discourse in the media's treatment of the many issues facing the nation. That my ombudsman position exists reflects that NPR sees these things as its mission, too. Other so-called liberal media, such as The New York Times, The Washington Post and PBS also have ombudsmen. What is striking is that Fox News and The Wall Street Journal don't. Juan Williams failed to make his case that NPR is muzzling conservative dissent. Finally, it is understandable that Graham and others would raise questions about whether Soros and his Open Society Foundation gained any editorial influence inside NPR in return for its $1.8 million grant. According to Dianne Brace, NPR's director of institutional giving, the gift amounts to roughly 1 percent of NPR's revenues this fiscal year. Whether NPR should have accepted the money is a management issue outside my purview. My concern is whether any Soros influence comes through in the reporting, in this case on Murdoch, and I find none. The grant, moreover, is for a project in which NPR is working with local public radio stations to help develop and expand their coverage of state government and its local impact. What the project does, in other words, is far from the battles over NPR, News Corp. and Rupert Murdoch. Tomorrow: Did an order go out from NPR's editors on how to treat the Murdoch coverage?